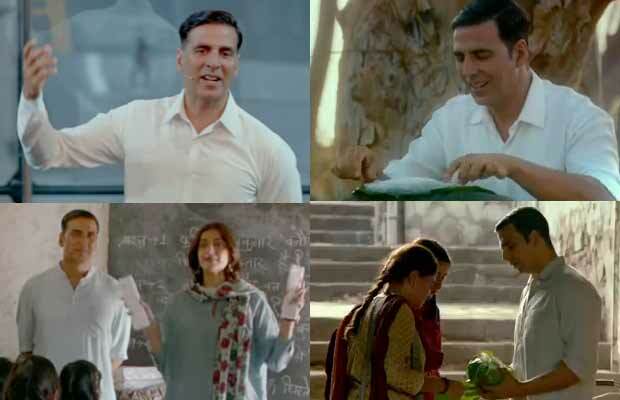 Padman Trailer OUT: Akshay Kumar's Revolutionary Act Will Win Hearts! Home BOLLYWOOD Padman Trailer OUT: Akshay Kumar’s Revolutionary Act Will Win Hearts! Padman Trailer OUT: Akshay Kumar’s Revolutionary Act Will Win Hearts! Akshay Kumar starrer Padman trailer is out and it proves that only Akki has guts to address on such taboo subject. Bollywood actor Akshay Kumar has enjoyed consecutive hits this year, with his two content oriented films- Jolly LLB 2 and Toilet: Ek Prem Katha. Well, the Box Office king is back with another film, Padman. The first trailer of the film is out and it only proves why he deserves receiving critical and commercial acclaim every time for his films. The much-awaited trailer is out and it looks amazing. Padman trailer sees Akshay Kumar as a madman who is crazy enough to change the world. The trailer begins with Amitabh Bachchan narrating that the USA has superheroes but India has Padman. The Khiladi actor brings the idea to make sanitary napkins for women and before anyone, he tries on himself. He then goes to his sisters and his wife (Radhika Apte) to spread the message of using sanitary napkins. However, they feel ashamed. Later, a social worker played by Sonam Kapoor helps him after she realises his dreams to change the world. The two come together to change the thinking of the people for better. Akshay Kumar, who is delivering back to back hits is enjoying the best phase of his career. He has already given two hits in 2017 and looks like 2018 is going to be another best year. Over the past decades, his films, praised for its quality content, have always reaped more. Padman tells the life story of Tamil Nadu-based social activist Arunachalam Muruganantham, who revolutionised the concept of menstrual hygiene in rural India by creating a low-cost sanitary napkins machine. Directed by R Balki, Padman also stars Sonam Kapoor and Radhika Apte in main roles and is scheduled to release on the Republic Day. The film will reportedly clash with Sidharth Malhotra and Manoj Bajpayee-starrer Aiyaary at the box office. Previous articleThe Mystery of Akash Ambani’s EXPENSIVE Wedding Card Revealed!